This article is the fourth part of a series by UNG Libraries covering some of the newest and most exciting additions to our GALILEO Database collections. A new post will appear on the last Monday of every month of Academic year 2015-2016. Please note: login required for off-campus access to some links. Information created by the United States federal government seems appealingly useful because it is authoritative and much of it seems reliable; finding the government information you need, however, isn’t always easy. Sure, you can do a Google search or you can search USA.gov (the official web portal of the United States government), but you may have to sift through many – even hundreds of thousands – of results to find a particular document or information resource. Even after you’ve drilled through all the results, you still may come up empty-handed. Fortunately, there are some governmental databases that are especially useful for locating U.S. government information. In addition to the CGP, the Government Publishing Office created MetaLib, a search engine that searches over 60 governmental resources. MetaLib allow users to select and search up to ten databases at once. These include “catalogs, reference databases, digital repositories or subject-based Web gateways.” Once the results are generated, then the search can be narrowed by clicking on one of the facets (e.g. topics, dates, authors, etc.) on the right side of the search results page (see figure 2 below). People accustomed to getting search results at the speed of a Google search may become frustrated using MetaLib. Users may have to perform multiple searches to locate the desired information resources and that can get to be a bit tedious. As is true with all database searches–the better your search terms, the better your results. Another tool from the Government Publishing Office is the Federal Digital System, or FDsys. The emphasis of FDsys is on “authentic government information.” Because digital text and images can be manipulated, it isn’t always easy to determine if the information presented is both original and legitimate. FDsys provides authentic, verified, and digitally signed PDF documents that mitigate those concerns. In addition, the GPO guarantees “permanent public access to all FDsys resources.” FDsys include around 50 collections from the executive, judicial, and legislative branches of the Federal Government. The Catalog of U.S. Government Publications, MetaLib, and FDsys are important tools for discovering government information. These tools work well for researchers and advanced students. But some students are going perform a Google search, almost by instinct. For these students – and anyone else seeking government information – there’s a way to search Google more effectively. 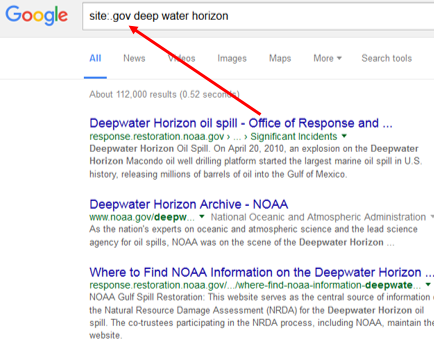 One can limit the domains that Google searches by typing the word site followed by a colon and then dot gov. (In other words, type: site:.gov,) followed by your specific search terms. Google will only search website with a .gov domain (see figure 3). These searches will also pull in government information authored by the state legislatures, departments, agencies, and so on. 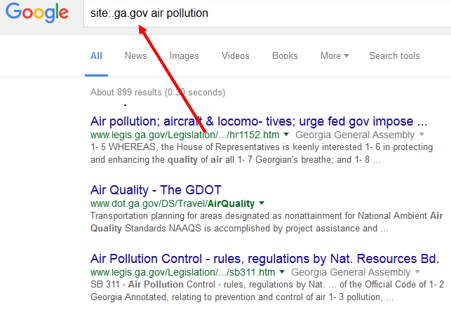 If you want to limit your search to just information from Georgia state governmental and regulatory bodies, simply type site:.ga.gov followed by your search terms (see figure 4). If you have any questions about finding government information, please ask the UNG librarians. We’d love to help you.